SAMSUNG ON 7 PRO FRP LOCK REMOVE & BYPASS FIX/WITHOUT DATA LOSE FRP REMOVE METHOD. Samsung On7 Pro After Hard Reset.Your Phone Show Frp Lock.Your Phone Need For Already Logine Gmail Id & Password.If Forget Your Gmial Id & Password Then Show Frp Lock. Required Files To Frp Unlock For On7 Pro Nougat V6.0.1. 1# Download google account manager v6.0.1apk. 2# Download frp remove apk. 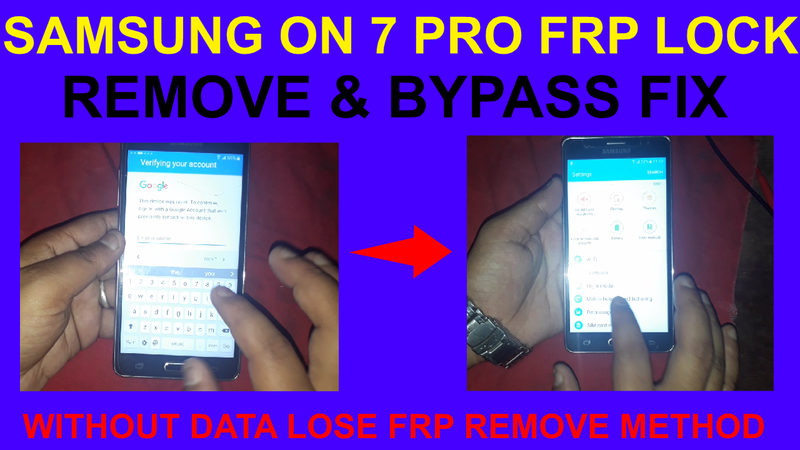 How To Remove Frp Lock On Samsung On7 Pro. 1# Open your phone on normal mode. 2# Connect your phone on wifi. 4# Go to keyword size. 6# Select all & share. 8# Now open google browser. 9# Types file & open. 10# Copy on sd card google account manager v6.0.1apk & frp remove apk. 12# Open otg cable file. 13# Install google account manager v6.0.1apk. 14# Install frp remove apk. 16# Logine your new gmail id. 17# Now rebot your phone after complite logine. 18# Your phone frp lock bypass complite. 20# Open google & remove gmail id. 21# Now your phone remove frp without data lost. If You Any Problem For Samsung J7 Prime Frp Remove See Video.